Tucson, Ariz. • One by one, after slapping hands with the hundreds of BYU fans who crowded down to the bottom rows of Arizona Stadium, BYU football players ran off to their locker room with looks of pure joy on their faces. All those changes that head coach Kalani Sitake made in the offseason, including the release of popular coach Ty Detmer, seemingly paid off on a hot and humid Saturday evening in the desert. 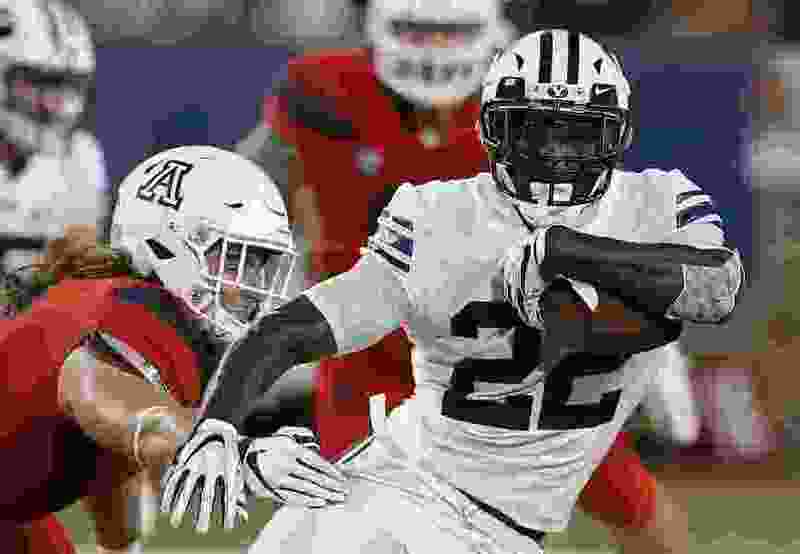 Squally Canada ran for three short touchdowns and senior quarterback Tanner Mangum outplayed his counterpart, Heisman Trophy candidate Kahlil Tate, as BYU surprised Arizona 28-23 in the season opener for both teams in front of 51,002 onlookers and a national television audience. “It was a big relief, and a much-needed win for our program,” said junior offensive lineman Thomas Shoaf. So the Cougars are off to another 1-0 start, but this one feels a whole lot different than the 20-6 win over Portland State last year. The key will be to play well against Cal next week, and not lay an egg like they did in Week 2 last year against LSU. “Any time you can get a win, and do it on the road against a Power Five team, a Pac-12 team, it is good for us,” said Sitake. The coach was most proud that the Cougars sealed the win behind their revamped offensive line, which paved the way for Canada to not only run for three scores, but pick up several valuable first downs when the Cougars were playing keep-away in the final few minutes. The Cougars rushed for 183 yards, while Mangum completed 18 of 28 passes for 209 yards and the TD, to sophomore Matt Bushman. That added up to 392 yards, after BYU got just 135 in the first half. “Our offensive line did a great job all night, moving the line of scrimmage and creating holes,” Mangum said. The debut of new offensive coordinator Jeff Grimes’ offense was lackluster in the first half, then brilliant in the third quarter, when the Cougars basically won the game with three unanswered touchdowns on drives of 75, 58 and 36 yards. The Cougars said they guessed before the game that Tate would try to beat them with his arm and not run the ball unless he absolutely had to. They guessed right. The quarterback who rushed for more than 1,400 yards last year carried the ball just eight times, for 14 net yards. He was 17 for 34 through the air, for 197 yards and a touchdown to Tony Ellison in the first half. Still, it got scary for the Cougars in the fourth quarter, after Canada’s third TD with 1:07 remaining in the third quarter gave them a 28-10 lead. JJ Taylor’s 1-yard touchdown dive with 3:20 remaining cut BYU’s lead to five, but the Wildcats’ try for two was inches short. The Cougars took over on their 25 with 3:20 left and Canada went to work. His 4-yard run on third-and-2 clinched it. Double-digit underdogs, BYU took a 7-0 lead on Canada’s 1-yard touchdown run, then watched Arizona reel off 10 unanswered points and the Cougars had lost control of the momentum. Somehow, they regained it in the 15-minute halftime, and opened the second half with a 10-play, 75-yard touchdown drive to regain the lead. Mangum threw a 24-yard touchdown pass to Tucson’s own Bushman a play after Dylan Collie made a 22-yard circus catch on third-and-12. 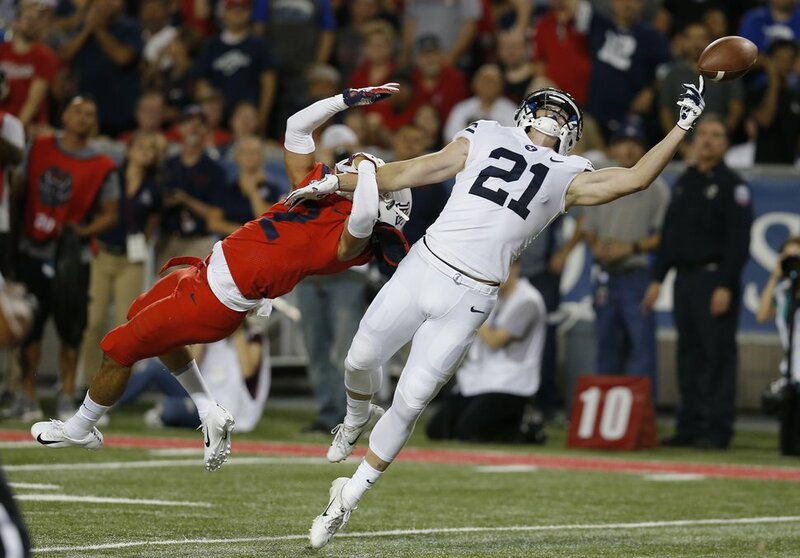 “Dylan’s catch was a huge play for him and it didn’t surprise me a bit,” Mangum said. BYU kept the momentum the next time it got the ball, driving 58 yards for another touchdown and a 21-10 lead. After seven straight running plays, freshman Dallin Holker caught a 14-yard pass to the Arizona 1 and Canada went in from there. The Cougars came up with their second-straight defensive stop of the third quarter, and got a 37-yard punt return from Michael Shelton to get back into scoring territory again. Canada’s third touchdown run, from 2 yards out after gambled on 4th-and-1, gave the Cougars the cushion they would need. “It is fun because we are a different team this year,” Pau’u said. “I don’t know if the fans can feel it, but we as a team can definitely feel it.